Here's an odd thing about being a writer. While you're working on your story, that's all it is: your story. All you care about is finding the right shape and rhythm for it, the right language. You sweat blood trying as best you can to make everything you have in your head visible in the medium of words. Then it goes out of your hands into print, and turns into a book instead of a story, and suddenly this other question arises: what sort of book is it? What kind of cover should it have? Where does it go in bookshops? Above all -- a question that I imagine occupies publishing houses fairly urgently -- who's going to read it? 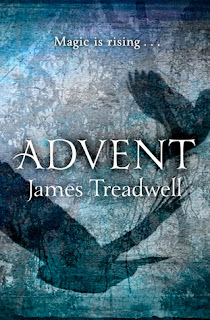 Having been invited to contribute to The Overflowing Library (thank you, Kirsty), and seeing as this is primarily a YA blog, I can't help asking myself: is my novel Advent, published in the UK this month, a YA novel? I imagine it's not an issue for lots of other writers, either. Presumably plenty of people write with a very clear idea of the genre they're working in. It also ought to be possible to write "for" a particular set of readers. (This would make the publishing houses very happy, right?) Though I suspect it's not as easy as it sounds -- readers being a lot more ready to be surprised than they're sometimes given credit for. It's a stumper for me, though. Is Advent a YA novel? I don't know. I didn't write it for teenagers. Nor did I write it not for teenagers. I didn't write it for anyone, to be honest. I wrote it because my protagonist Gav and his predicament and the story behind that predicament and the meaning of his predicament (which is to say, magic) had been waiting somewhere for a long time, growing bigger and more dangerous while they lurked, like one of those imprisoned intergalactic things in a Doctor Who episode, and eventually they got out and started chasing me (no assistant, alas) around until they caught me. When people ask me what I write, I always say "fantasy." But "fantasy" tends to mean at least three different things these days. (They're getting more different, too, which I think is sad.) There's "urban" fantasy (glamorous violence, edgy romance, vampire teens); there's "epic" fantasy (axes, taverns, dark lords); there's YA fantasy, which covers a huge range of stuff but tends to have in common the age and attitude of its hero/ines and the clarity and momentum of its plotting. I know, there are lots of other kinds of fantasy too, but in terms of covers and marketing and who's going to read what, these are the three biggest, clearest categories. But of course what I mean when I say "I write fantasy" isn't anything like that. I say it because I love (and always have loved) reading fantasy: or rather, I love reading books which get categorised as "fantasy". The authors of those books are my hero/ines, so that's the kind of writer I want to be when I grow up, and that's what I say when people ask. Really, though, it's not the right answer. When people ask me what I write, I ought to be saying "I write the stories that I'm able to write," or "I write what's in my head, or try my best to." But categories are powerful beasts, and no one can pretend they don't shape the way we understand things. I don't think there's any danger of Advent being taken for an epic fantasy. It lacks a single axe, there are no taverns (though there's a very short scene in a pub), and there's certainly no dark lord. Nor do I think that anyone will read it expecting something brooding and romantic and "urban." The cover's too light, and there's no flesh on it, and that's before you even get to the words inside. But I imagine quite a lot of people, teenagers and otherwise, might read it as a YA book. Its protagonist is fifteen. He's a boy who discovers that he's magical. (Hmmm …) It's a book in which our world, the familiar everyday one, opens up and exposes unfamiliar and wonderful things hidden within it, which is a familiar pattern in YA writing, for obvious reasons I suppose. Genre isn't "in" a story. Genre happens somewhere else: in the publication process, the marketing, the expectations of readers, in the world of reviewing and blogging and anywhere books are circulated and talked about. Genres are categories. To say "this is a YA book" is to say "this story, and the way it's told, and the way it's sold, and the way it's read, match the current state of that category." But stories aren't categories. They're just stories, struggling to come alive. All right -- I wouldn't actually try to say that, since I'd probably get kicked in the shins, or at least glared at. But this is the internet, so I'm safe, and I can say it to you. I hope you enjoy Advent, any way you want to. And if there are any actual young adults out there who'd like to let me know whether they succeeded in enjoying it, I'd be delighted to hear from them. After all, you're not a category either; you're a reader. I found this post fascinating. Thank you! Interesting post! I enjoyed reading it, and it made me think! Thanks! Really thought provoking post, thank you!